Sometimes having just one process improvement methodology just isn't enough for your organization. When you need to integrate multiple methodologies together, Excellence in Measurement Technology can help. Whether you need to implement multiple ISO standards, CMMI with ISO 9000, CMMI with Agile, or any other combination your organization needs, we can help you implement them together in a way that will satisfy their requirements without creating conflicting processes or redundant work. Unlike other consultants who may only understand a single process improvement methodology, our consultants are knowledgeable in multiple models and standards. With our unique insight, we can help your organization implement multiple methodologies together effectively. Our consultancy has years of knowledge and experience with both CMMI and Agile and a successful history of implementing them together. Contrary to popular belief, we have found that there is a significant amount of overlap between CMMI and Agile practices, and each methodology can help meet the requirements of the other. If your organization is using Agile and looking to implement CMMI, we can provide appraisal, training, and consulting services to meet your needs. If you need a CMMI Appraisal from a Lead Appraiser experienced in Agile practices, contact us to schedule your CMMI appraisal. If your organization has already implemented CMMI and is looking to transition from a traditional project lifecycle to an Agile one, we can provide training and consultation in Agile to help you implement it harmoniously with CMMI. Contact us about our Agile training and consulting services. Many organizations have to contend with both CMMI and ISO standards, especially those in the software development field. If your organization already uses either CMMI or an ISO standard but needs to implement both, we have you covered. In addition to CMMI, our consultants have experience in ISO 9000 (quality management), ISO 13485 (medical devices), ISO 20000 (information systems), and ISO 27000 (information security). We can help you integrate both CMMI and ISO standards by showing you where their practices overlap each other and how to effectively integrate both of them. If you need a CMMI Appraisal from a Lead Appraiser who understands these ISO standards, or an ISO internal audit from a Lead Auditor who understands CMMI, contact us. If your organization is looking to implement CMMI alongside the Scaled Agile Framework®, Lean, or Six Sigma, we can help you integrate CMMI with other methodologies within your organization. The Scaled Agile Framework® provides more structure for an organization's processes than Agile alone, and integrates well with CMMI, especially with Maturity Level 3 practices. If your organization has implemented CMMI and is looking to start with SAFe, or vice versa, we can help. 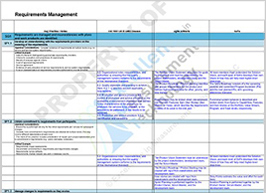 Contact us about our SAFe and CMMI appraisal, training, and consulting services. Do you want to integrate Lean practices with CMMI in your organization? We can show you how Lean and CMMI can work well together with their shared emphasis on process improvement. Contact us about our Lean and CMMI services. If your organization is looking to implement High Maturity CMMI practices, we recommend Six Sigma as a great tool to use. Contact us for training and consulting on how to incorporate Six Sigma into your CMMI practices. Your organization doesn't have to practice CMMI to benefit from our expertise in implementing multiple process improvement methodologies. If instead of CMMI, your organization would like to use ISO 9000 and Agile together, Lean with Six Sigma, or any other combination of the methodologies we provide services in, contact us about how we can help you integrate your desired methodologies together in your organization. Learn how the practices of CMMI for Development, ISO 9001:2015, Agile, and the Scaled Agile Framework can be integrated together in your organization. 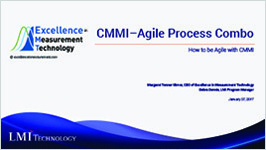 View our presentation created together with our client LMI to discover how CMMI Process Areas and Agile ceremonies correlate to each other and how to successfully implement both, featuring LMI as a case study. 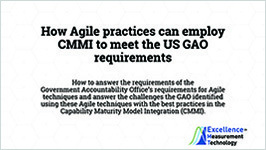 Learn more about how Agile and CMMI can work together with great results in our presentation about the U.S. Government Accountability Offices' findings on the Agile methodology and how CMMI can help organizations overcome the challenges of implementing Agile. Copyright 2016 © Excellence in Measurement Technology LLC & Ltd.